Should we happen to find £60,000 down the back of the Asylum sofa today, we know exactly how we're spending it -- on a boat which resembles a Great White Shark and can jump 12ft into the air. 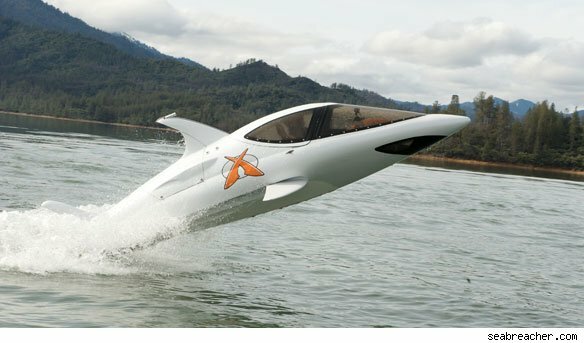 The Seabreacher X is an amazing boat/submarine/shark-thingy which has been dubbed the ultimate millionaire's toy, and it's not hard to see why. Measuring 12ft long, the craft is the same shape and size as a toothy Jaws - complete with a dorsal fin - but contains two seats, LCD screens, a GPS and even an iPod stereo dock. Powered by an engine similar to those in a high-powered jetski it can reach speeds of 50 mph on water, or 25 mph after diving below the surface. Which is where the fun starts. Makers say upon completing a high speed dive, the Seabreacher can jump out of the water while mimicking the "tail articulation of real aquatic animals like sharks and dolphins." And with a viewing screen resembling the mouth of a Great White, it would surely be hard to restrain yourself from scaring the living daylights out of surfers.